In this age of super-sophisticated encrypted communication among U.S. military commanders in Iraq and Afghanistan, Sam Billison's World War II expertise seems almost archaic -- until you realize that the Japanese, with all their code-breaking expertise, never came close to cracking Billison's radio messages as the Marines battled across the Pacific some 60 years ago. Billison, 79, is president of the Navajo Code Talkers Association, a group of Navajo tribe members who joined up for a top-secret code project during World War II that is credited with keeping the Japanese forces completely in the dark. Billison was in Orinda this week, giving a lunch talk to the Lamorinda Sunrise Rotary Club about his experiences during the war. His talk came as the United States and its wartime allies spent the first part of the month commemorating the 60th anniversary of the D-Day landings in Europe. And earlier this week, there was a ceremony in the Pacific that paid tribute to the Marines who stormed ashore at Saipan in the Mariana Islands, a signal event in the U.S. push across the Pacific toward Japan. even talk to his own family about what he did in the war. The government didn't declassify the World War II code until 1968. Sitting in a small conference room in Orinda, Billison was dressed in a bright yellow shirt, with his campaign ribbons pinned to his chest and the code talkers' association patch sewn on his right shoulder. Billison came ashore at Iwo Jima in February 1945 and was on the front lines for 26 days straight. Like many combat veterans, he is circumspect when describing those horrific days and nights. Asked what it was like, he says, "It wasn't a Sunday picnic." He prefers to talk about how the code talkers got started, and how it took years -- decades even -- before the nation recognized them. "It's a shame," he said, because many of the code talkers died off long before the government finally said it was all right to talk about what they had done. Of the original group of 421 Navajo code talkers, only about 100 are still alive. "They never got to tell their parents," Billison said. "In fact, my parents passed away before 1968. They never knew what I did." 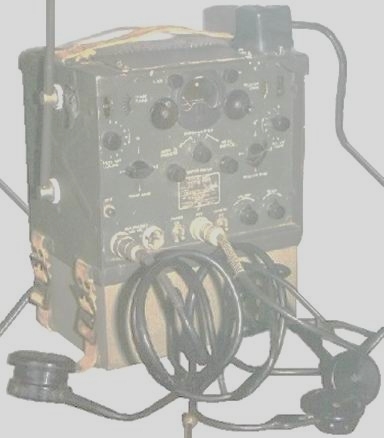 Billison says the "concept (of code talking) came from World War I," when the United States used Choctaw and Comanche soldiers to chat back and forth on military radios. "The Germans didn't understand Choctaw and Comanche," Billison said dryly. 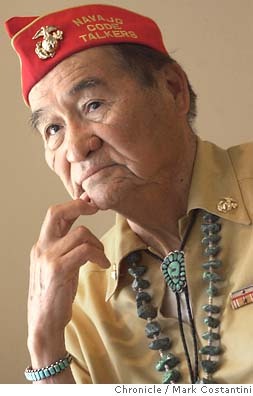 After the United States entered World War II, Philip Johnston, son of a missionary to the Navajos and one of the few non-Navajos to speak their language, approached Marine Maj. Gen. Clayton Vogel and convinced him that the complex Navajo language was ideal for secret communication. Navajo has no written language and, instead, uses a phonetic alphabet. Marine recruiters brought a first group of 29 Navajos to Southern California, put them through boot camp, then told them about their new task. "The officer told them, 'OK, boys, come up with a code,' " Billison said. "He locked the door and left. These young guys didn't even know what 'code' meant. But they started talking." Days later, they had the rudiments of a code. They broke it down into three subject areas, Billison said, that would be constantly used in wartime: "air -- anything that flew would be named after birds; ground -- this would be war machines; and sea -- names of fish for different kinds of boats and ships." Instead of having one word for the letter "a," they had three. So, with phonetic spelling, it went like this: Wol-La-Chee meant Ant; Be-La-Sana stood for Apple; and Tse-Nill meant Axe. And so on, down to Z. "They wanted to have more than one word for each letter of the alphabet," Billison says, "because if you keep saying Wol-La-Chee, the Japanese will find out what it means." None of this was committed to paper -- it all had to be memorized. When the Marines invaded Iwo Jima, Billison says, he was kept on the ship for the first couple of days, encoding and decoding messages around the clock. A few days later, after he'd gone ashore and was in the thick of battle, a second lieutenant was killed. Billison, another Navajo code talker and a sergeant were called in. "One of us was going to replace that lieutenant," he said. Finally, the officer in charge looked at the sergeant and said, " 'Well, the code talkers have more important business than being a lieutenant,' and the sergeant got the job." In a war that saw many combat servicemen getting swift promotions and even battlefield commissions, Billison said, the code talkers were never promoted above the rank of private first class, something that rankled long after the war ended. Several years ago, when Billison was giving a speech at a code talkers' reunion at Camp Pendleton in San Diego County, he saw that the speaker following him was the commandant of the Marine Corps. At the end of his speech, Billison remarked with a smile that, "We were PFCs all through the war, and this morning we saw a Marine Corps (marching) band and all those guys are sergeants-major. These guys are tooting horns, and we were out there shooting rifles. I just wonder what the explanation is." "So at the end of his speech, the general looks over and says, 'As of right now, I make you all sergeants-major.' Which, of course, was kind of a joke because we were all civilians." Nonetheless, Billison said, "The next day, down at the base exchange (store), there's several code talkers buying sergeant-major stripes." Billison said that when he goes to speaking engagements around the country, the most common question is: "The United States did a lot of bad things to your tribe. Why did you fight for your country?" "And I tell them, we still think of North America as our country."